Project obstacles and solutions: The Acton Lake Dam at Hueston Woods State Park was in need of repairs. Studies revealed that the dam, which was constructed in 1956, was seeping water through its earthen components and was listed as a high hazard dam. Water from the 65 foot dam flows down a spillway and into Four Mile Creek. The Ohio Department of Natural Resources wanted to be able to secure the proper repairs to the dam without lowering the water level of the lake so boating would not be impacted during the construction process. Sunesis Construction was selected as the general contractor for this project. 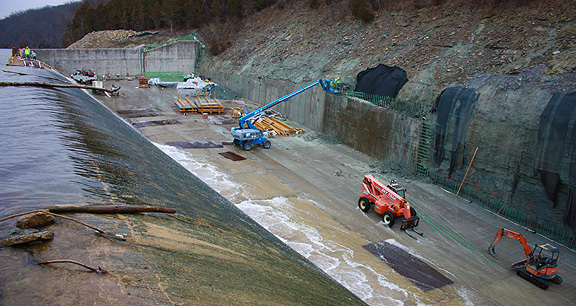 The lower part of the dam and spillway area was torn out and reconstructed during the summer of 2014. The 5' training walls of the spillway channel were removed and rebuilt, along with 8 sections of the upper spillway floor. Sunesis built a toe drain to control erosion below the water line. After this, the walls of the upper spillway, perpendicular and adjacent to the weir, were removed and rebuilt. IMI supplied 5,000 yards of concrete for this project. This included State of Ohio QC-1 and QC-2 compliant concrete for the walls of the spillway. The upper walls were tied to the stone cliffs with epoxy coated rebar and then backfilled with imix Flexifill, a flowable backfill product. IMI supplied 500 yards of imix Flexifill for the upper walls. Since the water level was not dropped for construction, delivery of concrete was challenging. Mixer trucks drove into the water and up the spillway channel. A concrete pump was parked on the spillway floor for the 30' walls of the upper dam. Water levels were monitored for safety. Sunesis built a water diversion form on I-beams to temporarily cut off the water flow from the area where they were working. During the work on the weir and the lake drain structure, a cofferdam will be used to secure the area. The spillway is scheduled for completion in July 2015. The dam reconstruction is scheduled to be completed by the end of year 2015.